There are 2 things I have failed to be able to create, one is shoes the other is hair, so when I find a good designer I go a bit mad and will wear their designs all the time until I find someone new. Recently at the Styles of edo show for Narkissos I saw the designs of KateForster Akina of Ttukinowaguma hair and thought I would go and take a much closer look as several of the shorter styles looked like my style. One thing I have consistently noticed with updo's is although the back may be incredibly intricate and lovely the front lets the styles down with Ttukinowaguma hair the front is as detailed and for a change the eyes are not covered - this may just be a fashion trend of the moment but 90% of the styles I like also cover the eyes too much - these do not. In fact the range of styles is pretty big with both mens and womens styles in long and short. Most of the styles can be seen on KateForster's BLOG this is in japanese so if you use THIS LINK you can see the google translation of it. All styles have colour change options with accessories also having 133 colour options. I have seen many hair designers and love a few of them but I find it refreshing to see a hair designer with a flair for different this is one for the favourites folder! speaks of simple elegance that only enhances the shopping experience. NEW: My Precious Photo Contest: "The Perfect Bloom, Love in May"
board for all the details. elegant and wonderfully feminine. I had to "twirl" right there in the store! Yes, one word - Elegance. clothing line - true elegance. One pet peeve of many ladies in SL is the ugliness of toes in fact we have written about this before and wearing open toe shoes was a definate 'no no' - now its a big YES! These pretty open toe designs are from Virtual impressions and come with so many options it would be impossible to show you all of them. Chrissy has incorporated scripting with cunning design which allows the owner to change any aspect of these shoes' colour from the studs to the intricate toe ring stone or even the metal. But the main thing that I found impressive is the toes - why? Well everyone has individual skintone so how could these match? The skin tone can also be changed - choose your basic colour from the menu then adjust it lighter, darker, more tan, less pink, more peach etc, if you can't match your skin tone I would be amazed - you can even change the toe nail colour to match your outfit, with just 2 or 3 pairs of these shoes you would never need another shoe in SL again! 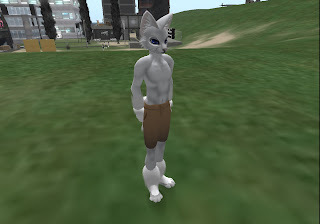 One of the upcoming avatars that I had heard the most about is the anthro “Felis” domestic cat avatar by Uchi Desmoulins, notably through Internet film clips. A few days ago, I heard a beta version was available for free. So some friends and I went to the Curious sim to go get a copy. The sim had a few structures, including an underground sewer. 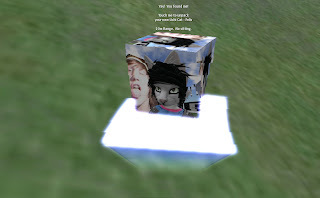 As for the avatar, to get a copy one had to find a marked box and click it within 10 meters of it. Once someone clicked on it, it would vanish and appear else where in the sim. 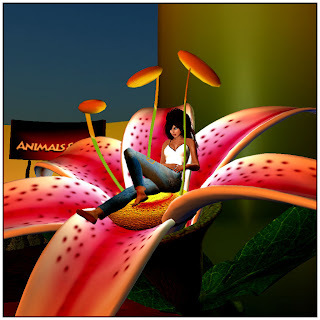 To help others looking for it, some people who already had the avie would sit on it to make it easier to see. What made things tricky was when it appeared in the vortex in one corner of the sim. It was inside a depression marked off with “do not cross” tape, a little fencing, and signs. The vortex crackled with lightning, and dust rolled down the rim and into the hollow, disappearing in the hole. Anyone getting too close, whether on foot or flying in the air, would be sucked in and ported elsewhere in the sim. Needless to say, when the box appeared there, getting it could be a challenge. For a free avatar, the beta Felis is very good. My friends thought it looked great, some mentioning the detail of the whiskers, and one the muscle tone. Someone in a group chat thought it had a lower ARC than most feline avies he knew of. The avatar has a built in “Muzzletalk,” and will move it’s lips when speaking, or if the nose is clicked. The eyes are also adjustable, both the color and the width of the pupils from huge and round to narrow slits to somewhere in between. Uchi also made available a box with two more pairs of eyes, one having pupils that get smaller instead of narrowing. The “Box of Eyeballs” appears near the main entrance. The avatar has no head hair other than fur. But one can easily get it elsewhere (I use the hair from my Wingless avatars for it). And only comes in one color: white. The Felis is not Uchi’s only free avatar. Earlier this year, Uchi made available a beta version of his Ringtail for no charge. April 14, 2009 --- Poptart Lilliehook, CEO of Modavia Fashion Marketing and publisher of the Modavia Fashion Directory is pleased to announce the launch of a new division, Modavia Productions. 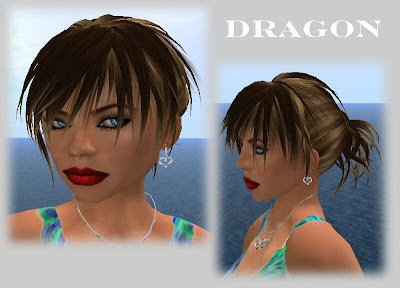 This new subsidiary of the successful fashion house will produce major fashion events, seasonal revues and special interest showcases for the fashion industry within Second Life. While remaining wholly owned by Ms Lilliehook, the production company will be headed up by Payton Heron, ex Creative Director of RUNWAY Productions, and will act independently of the Fashion Directory. RUNWAY Model of the Year, Modavia Supermodel, and marketing guru, Payton Heron, will work with designers to ensure that garments are presented to the consumer in line with their vision for the brand and that all related marketing activity is well executed. Payton will also play an integral role in all aspects of the productions, from casting and set design to choreography. “I am extremely excited to develop this new production company for Modavia and bring fashion events to a new level of entertainment. Modavia's reputation for excellence and the company's strong relationships with designers and stakeholders in the industry means we are very well placed to move forward at this time” says Payton Heron. Modavia Productions will be based on Lombok Island, at the current home of the Modavia Fashion Directory, Modavia Designer Wardrobe Giveaway and the Modavia Supermodels and Models groups. It was a packed event showcasing some of the designs of the shopping village - a huge variety in style and design. 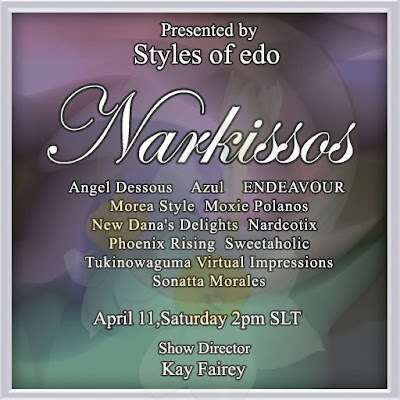 Narkissos is a fashion village with brands that edo Tone, of Styles of edo, had hand picked and this was the first Narkissos Fashion Show. In selecting the brands, edo thought of the balance of style, quality of makes and future potential of the brands that were to occupy his sim. Offering new brands a place to be seen and develop under edo's expert gaze. We saw Lingerie from Angle Dessous, gowns from AZUL, moxie Polano, Morea Style and Nardcotix, Sonatta Morales brought us vintage wear plus kimonos from Sweetaholic for both men and woman. My compliments to all the models and Kay Fairey who put on such a well run event in a set designed perfectly for a large audience by Edo Tone. I look forward to many more as this is just the first of many planned. I have been having trouble letting people know with all my new releases just recently so I decided it was time to start a blog dedicated to NDD. Here you can see each release - I often release 3 or 4 designs at once so this is an easy way to keep up. Sam's Secret, located at Rue DAntibes sim, is a cute female boutique by Samsara Nishi, who has been creating her own fashion world since February 2008. All her textures are hand made. The creation process starts depending on her mood, and sometimes depending on recent experience she had inworld or in RL. As an aspiring photographer here in SL (and one who just cannot seem to build anything but a square box), I found a wonderful selection of items at M&M that I could use in my studio. So I'm making my list! 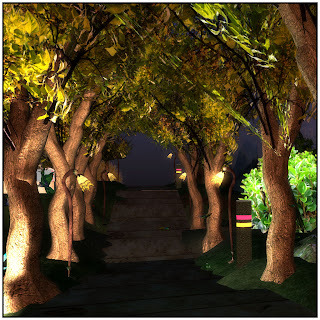 A vast array of creative lighting prims can be found to select from. Any number of them would serve well as props to provide "just the right" mood to the photos I take. Their well-sculpted trees are breathtaking - so realistic! One or two of those added to a scene would add depth and character to any portrait. And... to my utter surprise and delight, M&M even offers particle poofers in a great variety of styles, colors and sizes. But I was particularly excited to find the "Lily Mysticalia" chair ! Not only would it make a conversational enhancement to the land around my studio, but could double as a prop for an inspiring photograph! M&M Creations truly does offer an incredible selection of products that add the finishing touch to your own creations - or... inspiration for ... even photos! Join us and see an amazing variety of designs from traditional kimonos to ballgowns!